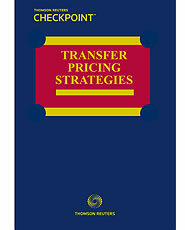 Lowell and Martin's Transfer Pricing Strategies distills the critical elements of planning and controversy matters into a deskbook that can be a ready reference for anyone interested in transfer pricing. These include developing and applying transfer pricing strategies to assist multinationals in achieving their objectives; handling matters pending with examination teams, auditors, and administrative appeals; advance pricing agreement programs; treaty and Competent Authority processes; litigation; and the evolving area of arbitration. This product provides the market with a deskbook covering the basics of transfer pricing without going into the higher-level detail of a treatise. It serves both as an entry level to the treatises and as a product for those who will never need the expanded details of a treatise. Transfer Pricing Strategies provides straightforward non-technical explanation, heavy with practical examples of issues that arise at a CFO or a tax compliance level. Transfer Pricing Strategies is an ideal reference for tax lawyers and accountants who do not specialize in transfer pricing issues, and also for tax and finance executives at corporations, who require an introduction and overview of key issues of transfer pricing without extensive detail of a full treatise. Transfer Pricing Strategies will save readers time by bringing high-level information into one place and provides examples and illustrations to minimize guesswork when applying laws and regulations to actual situations. To order, please call 1.800.950.1216 or contact your sales representative.